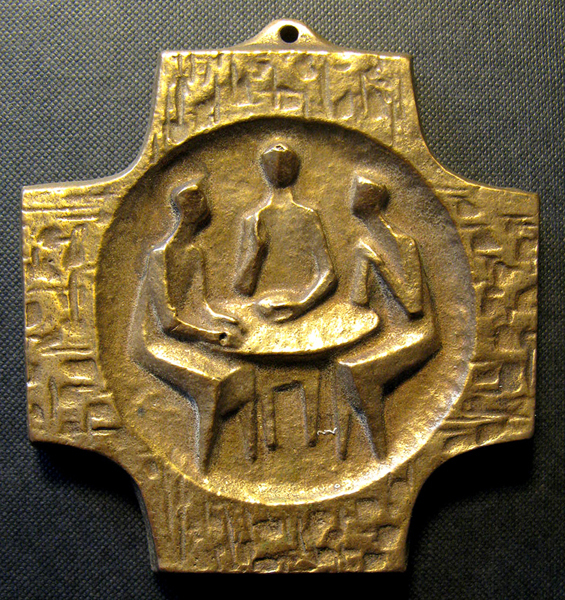 Cross with Christ and the disciples at Emmaus, especially adapted for the Catholic St. Paul’s school in Bergen, Norway, 1973, 9,2 x 8,7 cm. Cast bronze, ca. 1970. In the back the crest of the school is seen, surrounded by the following inscription: ‘St. Paul skole, Bergen 1973’. 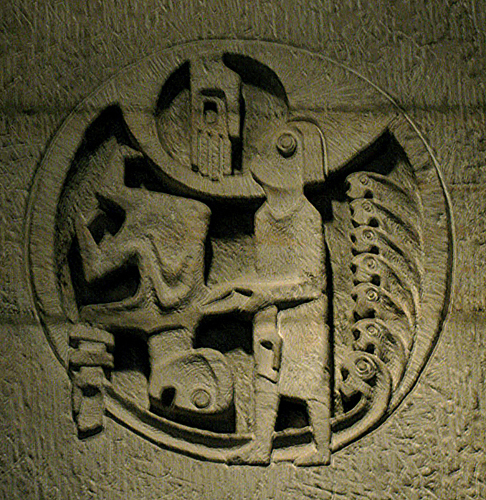 Heinz Heiber (1928-2003): Stone relief, 1962: ‘Der Auftrag Christi an die Christen und ihre Stellung in der Welt’, in the nave above the main door in the Protestant Marktkirche in Hannover. 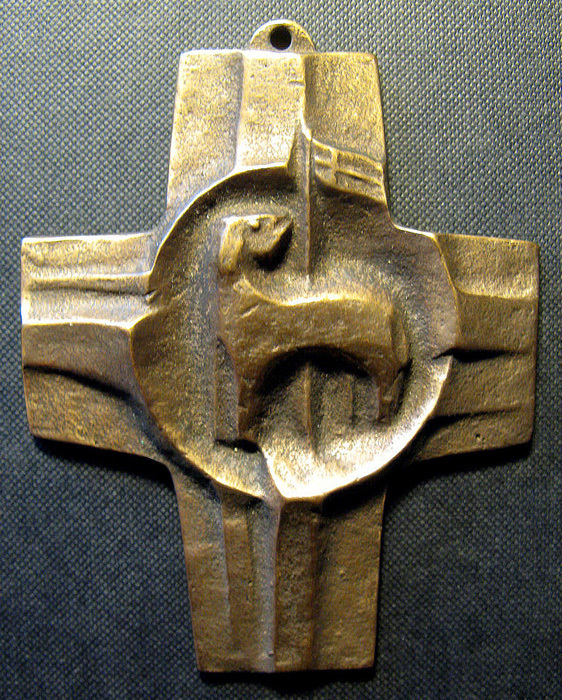 Egino G. Weinert: Cross with embedded corpus, cast bronze, ca. 1968; bought in a Catholic bookshop in Köln 1972, 14,1 x 10,8 cm. Still produced . 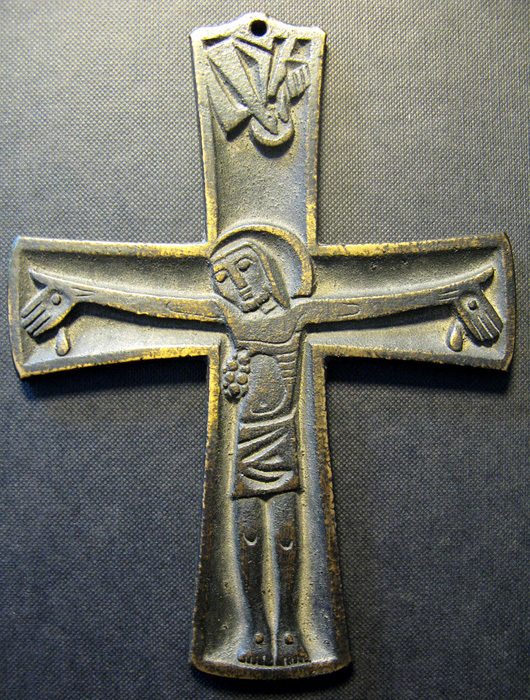 Egino G. Weinert: Cross showing Christ washing the feet of the aspostles, made as a gift for those receiving their first holy communion in 1979. on the back John 13, 12b-15b in German. Cast bronze, 1979. Bought in Germany in january 2011, 8,6 x 6,7 cm. Still produced. 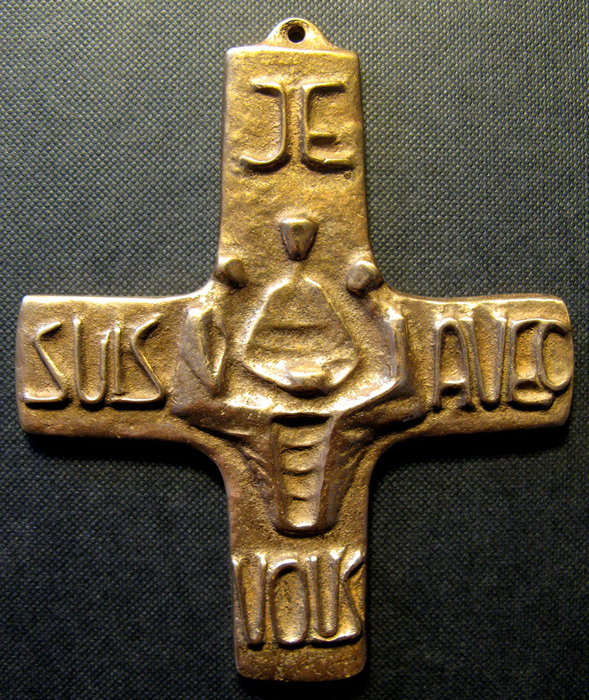 Cross with Christ and the disciples at Emmaus, on each cross arm the inscription in raised letters: ‘Je suis avec vous”. Cast bronze, ca. 2005. Bought in the shop in the cathedral of Antwerp 2007, 10 x 8,4 cm. However, the basic tension between the development of modern art and the requirements of the devotional art had not disappeared. Particularly in Germany, the solution seemed to be the development of a special religious style, which has dominated devotional art and objects for decades: A slightly abstract, stylized and simplified style, borrowing some features from Romanesque art, but immediately recognizable as belonging to the later decades of the 20th century. Features of this basically figurative style rendering Christian motifs came from the art of sculpture and medals developed at the Kölner Werkschulen from the 1950s and onwards, with artists such as Hilde Broër (1904-1987), Heribert Calleen (b. 1924) and Jochem Pechau (1929-1989). One of the important artists within that particular religious style, influencing its development considerably, was the German sculptor, Egino G. Weinert (1920-2012). This contemporary religious style rendered devotional objects ‘modern enough’, yet still iconographically unambiguous. In addition to the stylistic features developed in the religious art of that era, the post Vatican II social consciousness often comes through. Typical in this respect is the depiction of the Footwashing on the First Holy Communion cross of 1979, where one would previously have focused on the Sacrament itself and its species. A tremendous amount of such works has been produced since the 1960s, mostly in bronze, and they are still found everywhere today. The bulk of these products are often made for firms which are rather unwilling to reveal how they go about building a stock of products, and quite often they insist on not disclosing the names of the artists. Yet, a lot of designers and artisans must be employed to produce ever new variants within this established ‘latter half 20th century German religious style’. This may be said to amount to a new ‘Kunst-Stil’. In 1957, the prominent German theologian, Erich Przywara (1889-1972), was critical of ‘die heutigen Experiment eines neuen sakralen Kunst-Stils’ which tried to articulate a kind of archaic primitivism (archaische Primitivität). He maintained that the Sacred and the Christian could not be launched as the defining features of a specifically Christian style, since this would most probably result in ‘Erbauungs-Kitsch’, edificatory kitsch, and not real art. In this he obviously voiced the position of the Liturgical Movement, which a few years later would dominate the Vatican II treatment of these matters. Nevertheless, presented with the devotional bronzes of that era, one may, it seems, ask again: Is this phenomenon art or kitsch, mere devotional utensils or something more? Designers may be employed by firms like for instance the Buch- & Kunstverlag ars liturgica, Maria Laach, or they simply offer products to be sold by such firms. This was the case with Christoph Fischbach (b. 1930) who was manager of the casting workshop of the abbey 1959-70, but has continued to this day to sell artefacts through Ars Liturgica. However, in the present, 2014, on-line-catalogue of ars liturgica, Christoph Fischbach, Heinz Uppendahl and Andrea Zrenner are mentioned as artists behind a number of products. Their products are also presented by the Maria Laach monastery affiliated Te Deum Laudamus-on-line-shop. From the 1960s to the 1990s this distinct German devotional style dominated the market, not least through a multitude of anonymous products, and it is still to be found in various catalogues and shops today. So, this might be an interesting dissertation: Visualizing the World of Faith. The small Devotional Bronze sculptures of the post World War II Generation in Germany. Or: Visualizierung einer Glaubenswelt. Devotionale Kleinskulptur in Bronze der Nachkriegsjahrzehnten in Deutschland.